An error occurred while attempting to connect to server “[computername]”. Check that the Virtual Machine Management service is running and that you are authorized to connect to the server. 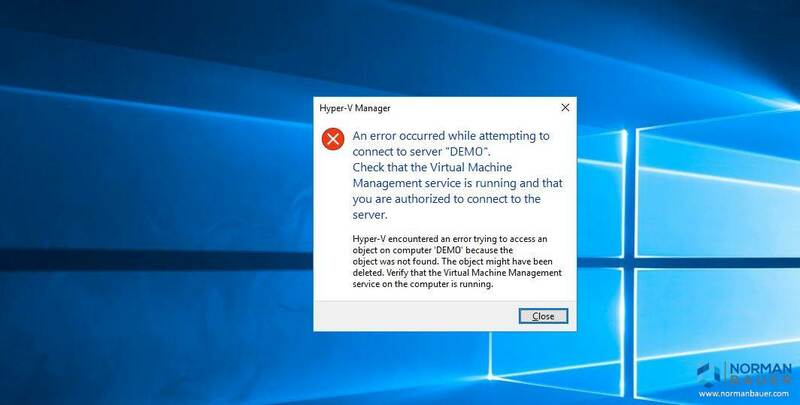 Hyper-V encountered an error trying to access an object on Computer ‘[computername]’ because the object was not found. The object might have been deleted. Verify that the Virtual Machine Management service on the computer is running. There is nothing in the logs and everything I tried didn’t work. In the end uninstalling the Hyper-V role and reinstalling it did fix the issue. However, sometimes simply reinstalling roles is not possible. When I experienced the same error again on another machine I investigated a bit more and finally ended up in restoring the Hyper-V WMI registration which fixed the issue without reinstalling the role. Thankyou, you saved me a world of pain ! Thanks a lot. It worked for me too. Just had the issue today. Did a google search and your article came up on top. Lucky me. This fixed it. Thank you. As somebody mentioned here also, it has something to do with installing HPE System Management Homepage after installing Hyper-V.
before doing this, use your domain administrator credentials if you have one if not use this command. I got messege: file not found. 0X80041002 Class, instance, or property ” was not found. Thanks for this article, it fixed the issues I was having with HyperV manager and HyperV 2016 core server. Worked perfectly! Thanks for posting! Wow. Thank you for this simple and effective article. Also happened after HPE software install. This fixed it! Thanks! Issue occurred on 11/13/2018 spontaneously on a computer I use Hyper-V on extensively. I literally had several VMs already open, left for a meeting, and came back to this error. Rebooting did not solve it. This did. thanks a lot, worked like a charm. i appreciate you saving the hair on my head. The suggested command did not work for me. For those who fall into this category, I resolved by opening Powershell on the host and typing > enable-psremoting -force. This will make the appropriate exceptions in your client firewall.